​Each package includes a Variety of sweets approximately 100g per person, enough sweet bags for 1 per guest, coordinated ribbon to match colour theme of the wedding and hire of crockery. A deposit for crockery will be required to cover damages if everything is returned unbroken and undamaged the full deposit will be returned. Crockery includes sweet jars, scoops, tongs and sweet table sign. delivery and set up within 30 miles is included in the price, please ask for delivery quote if you are further then the following postcode NR30 2DD. Personalized bags are available at an additional cost please ask for more details. Prices do not include someone to serve the cake table this is available upon request for an additional charge. 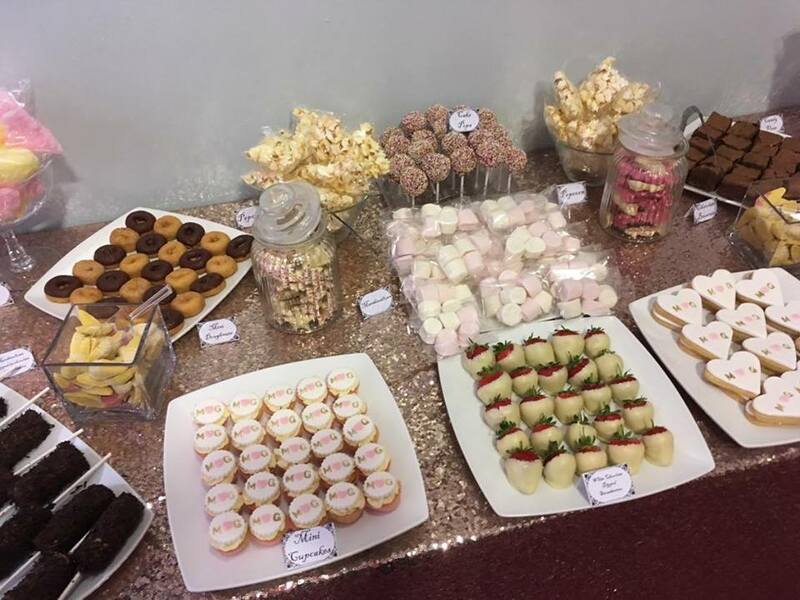 ​75-100 Guest includes a Variety of 12 different sweets of your choice £2.50 per head. 100-150 Guest includes a Variety of 14 different sweets of your choice £2.25 per head. Each package includes a Variety of cakes all of which will have either 2 or 3 layers of sponge and 1 or 2 layers of buttercream, each cake will serve between 16-20 people each package will also come with cupcakes, enough boxes/bags for 1 per guest and hire of crockery. A deposit for crockery will be required to cover damages if everything is returned unbroken and undamaged the full deposit will be returned. Crockery includes cake stands, cake knife, cake slices, a cake table sign and cake placement cards. Each package includes a Variety of cakes all of which will have either 2 or 3 layers of sponge and 1 or 2 layers of buttercream, each cake will serve between 16-20 people, each package will also come with a verity of 4-6 sweets and a Variety ​of choices from Kay's cakes sweet product list below. Kay's cakes will also supply enough boxes/bags for 1 per guest and hire of crockery. A deposit for crockery will be required to cover damages if everything is returned unbroken and undamaged the full deposit will be returned. Crockery includes cake stands, cake knife, cake slices, a cake table sign and cake/ Sweet treat placement cards. Choose from the following options from the list below for the cake and sweet treat packages. Victoria sponge with jam and buttercream. Chocolate sponge with chocolate buttercream. Chocolate sponge with jam and plain buttercream. Lemon drizzle cake with lemon buttercream and a choice of lemon curd. Oreo sponge with white chocolate buttercream and jam filling. Chocolate fudge cake with chocolate fudge filling. Victoria sponge with chocolate chips folded through it with Mint buttercream. Light fruit cake (Manor house style). marble cake with a jam filling and a mixture of chocolate and normal buttercream. Gluten free/Dairy free/egg free options are available. choice or normal or chocolate cupcakes. Marshmallows dipped in chocolate and sprinkles.